Only 8% of teachers believe government policy for free schools and academies in England will improve poor children's education, a survey has suggested. The National Foundation for Educational Research (NFER) survey of 2,199 teachers was commissioned by the Sutton Trust charity. The government said the survey ignored its wider plans to raise standards. Separately, the pro-free market Adam Smith Institute has said free schools should be able to make a profit. The teachers surveyed by the NFER were critical of the government's free schools policy, under which parents and other community groups can set up their own schools. Nearly two thirds (63%) of teachers disagreed or strongly disagreed that free schools would provide a better education for children in the local area. A similar proportion (67%) disagreed or strongly disagreed that they would drive up education standards, while 66% agreed or strongly agreed with the suggestion that they would lead to greater social segregation between schools in the local area. And when asked about the government's schools policy as a whole, just 8% of teachers said they had the potential to improve education outcomes for less privileged children, compared with 64% who said they did not. Teachers were a little more divided on whether the freedoms obtained when a school becomes an academy - control over more of its budget, curriculum, hours and teachers' salaries - would allow schools more time to focus on raising attainment. In total, 27% of teachers said they would - compared with 37% who said they they would not. The teachers tended to agree that schools do not have enough freedom to sack poorly performing teachers (56% agreed, compared with 21% who disagreed). But there was little enthusiasm for lengthening the school day to help improve attainment of disadvantaged children, with only 10% in favour of the idea and 77% against it. Opinions also varied on whether schools should be allowed to give priority in their admissions to children on free school meals (27% agreed, 42% disagreed), and on whether random ballots should be used to allocate places in popular schools (31% agreed, 41% disagreed). The survey was carried out in November 2010, in the run-up to the publication of the government's White Paper on schools, but after the passing of the Academies Act, which allows for free schools to be set up and more schools to convert to academy status. At that point, the government had said it had intended to give schools a "pupil premium" for poorer students, but had not named the amount - £430 for every student whose parents earn less than £16,000 a year. In the survey, teachers named "smaller class sizes", "additional teachers" and "additional support staff" as their top priorities for spending the funds. In response to the survey, a Department for Education spokesman said: "It is not acceptable that too often in this country your birth will determine your fate. The current schools system has failed to narrow the attainment gap for the poorest pupils - which [is] why we are overhauling the education system. "This report was written prior to the publication of our schools White Paper, which outlined our plans to raise standards, make every school a good school to give children from every background the chance to succeed." The report by the Adam Smith Institute, also published on Thursday, said the free schools policy was too "restrictive", had produced "disappointing results so far" and should be opened up to allow free schools to be run for profit. The institute said the English school system was "not fit for purpose". Researchers studied the Ofsted and Independent Schools Inspectorate's reports of profit-making schools, and concluded that "there is no evidence that profit damages outcomes", even when such schools' fees are similar to the amount spent per student in state schools. By early February, the government had received more than 300 proposals for new free schools. Of these, 41 have been given approval to prepare a business case, but only one has signed a funding agreement with the government. 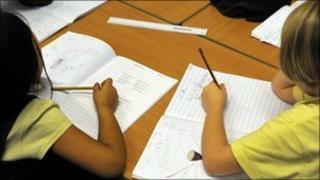 The Department for Education says it expects "more than 10" to open in September. It argues that they will give parents choice and drive up standards by boosting competition, but critics argue that they will largely benefit middle class parents who are able to campaign for the types of schools they want.